Over the past couple of weeks, I've been returning to Fallout: New Vegas, using the game to patch up downtime between the big releases of the fall. I've got a bunch of mods installed, but nothing particularly crazy. But if you DO want crazy, you could always follow Youpi's lead and make the game well and truly bananas. In a crazy "let's play" series of videos and images, we are taken through the wild, wooly, modded world of New Vegas, weirder than I've ever seen it. 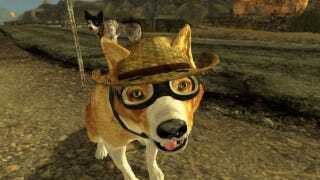 Anyone out there play with Wild Wasteland turned on? Would you ever download this many mods and hope to have the game actually run in a reasonable way? Is it only a matter of time before this same kind of thing is possible with Skyrim? Man. I like modding, but I feel like if I installed all of these, my PC would actually throw up on the carpet. Doesn't mean it's not fun to watch them, though. We'll be back with more random stuff from the Mojave Wastes as my (and maybe some other writers'!) return to New Vegas continues.